Serums are gaining recognition for the important and enhancing role they play in a great skin care routine. Regardless of your skin type, the best serums provide high concentrations of potent ingredients to protect skin from the visible effects of environmental damage, minimize signs of aging, and offer deep, intensified hydration. All this in a soothing, lightweight formula that can be worn under any moisturizer or layered with your other treatment products—the “missing link” to many skin care needs. The difference between serums for dry skin and serums for other skin types is how hydrating and extra rich the formulas are. Serums for dry skin should contain an advanced mix of water-binding agents and skin-reinforcing non-fragrant plant oils that deliver antioxidants. Our serums for dry skin provide those benefits in a silky-smooth texture that easily absorbs into skin, leaving a sheer yet glowingly restored appearance that lasts throughout the day—and provides smoothing repair at night. RESIST Intensive Wrinkle-Repair Retinol Serum Delivers pure retinol to skin in a silky-smooth serum fluid infused with potent antioxidants and superior skin-replenishing and skin-hydrating ingredients. RESIST Super Antioxidant Concentrate Serum Stabilized Vitamin C and peptides plus potent antioxidants combine to help preserve and rejuvenate skin’s surface and visibly enhance firmness. SKIN RECOVERY Super Antioxidant Concentrate Serum Smooths, softens, and fights the appearance of visible signs of aging as it helps strengthen skin so it’s better able to resist environmental attack and future signs of aging. Contains retinol and non-fragrant antioxidant-loaded plant oils. RESIST Omega+ Complex Serum Concentrated levels of omega fatty acids help replenish dull, dehydrated skin, revive a beautifully smooth, supple feeling, and visibly soften the appearance of fine lines and wrinkles. CALM Redness Relief Repairing Serum Immediately soothes sensitive skin and visibly calms redness with gentle, but potent, antioxidant plant extracts and skin-replenishing ingredients. Nourishing for dry skin and gentle enough even for skin prone to rosacea. All of these serums are formulated with a blend of beneficial ingredients that combine to deliver outstanding results you’ll notice from the first use. 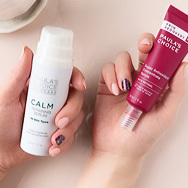 And, like every Paula’s Choice Skincare product, each fragrance-free formula’s ingredients were specially selected based on published research, not industry hype. The importance of serums to a great skin care routine is something we take seriously, so you can love showing off your new beautiful youthful-looking complexion! Learn more about face serums.